It's been quite the road over the past four years for Shawn and Christian. They began as outsiders—controversial figures unabashedly representing the Witch City identity that some in Salem so desperately wanted to move away from—to insiders who are respected and consulted, all without sacrificing their unique flair. They've worked hard to build relationships in the business and political communities and are grateful for everyone who has tried to understand what they're trying to do for Salem. Their black pointed hats bob above the baked brie in the food line and over the business people and city councilors queuing at the cash bar. Nowhere but in Salem does gothic black eyeliner mingle so effortlessly with bankers and city workers. Christian Day and Shawn Poirier are in their fourth year putting on Salem’s Festival of the Dead, a month long celebration of, well, life’s finale. As Poirier has often said, there is no more ardent lover than our own death. Yet, at a preliminary fund-raiser to re-elect Salem Mayor Kim Driscoll, held in the function room at Finz Tuesday evening, the ardent ones were Poirier and Day, making their way over to Driscoll to say a few words of encouragement. "I really do love her. I think she’s great," says Poirier, who says he psychically predicted Driscoll’s win last November. Her response to all this love is that her administration is, after all, about building bridges, Driscoll says with a smile. When Driscoll shares with the packed room one of her oft-repeated comments about "all the stars lining up" for a bright future in Salem, the two witches chuckle to one another. Prancing in his all-black regalia, standing out among the crowd, Day says, "Well, I couldn’t just come in," to a giggling Jason Silva, the mayor’s administrative aide. After dropping a $200 contribution into the basket, Day has his few minutes with Driscoll. He thanks her for the recent cooperation among city departments who scrambled to quickly get up to code the space at the Museum Place Mall where the two host their month-long psychic fair. "I don’t feel like she plays favorites with us or anybody," says Day. "She doesn’t always say ’yes,’ but she listens. It’s a better attitude than a constant barrage of NO." Day is referring to the contentious relationship he and his friends had with the previous administration. While he claims the festival wasn’t allowed to join Destination Salem, the city’s member-based organization of tourism and culture, he did sit on the Haunted Happenings committee this year. When the Festival of the Dead began in 2003, the organizers felt they were waging a constant battle to market Salem as a spooky witch city that celebrates Halloween 365 days a year, while they saw local officials trying to spin Salem as a quaint maritime village. City officials gave him the run-around, says Day, and would never give straight answers. Back then, he and Poirier saw the festival as an opportunity for those who don’t always play nicely together - the city’s Wiccans, witches or magical types of another kind - to all come together under the umbrella of the festival. "Everything I’ve been fighting for these past few years has come true," says Day. Poirier and Day, business partners and best friends, have appeared on "The Daily Show with Jon Stewart" on Comedy Central, as well as many major media outlets. This month they were interviewed by NBC Nightly News and the Wall Street Journal and at one time were in discussions with a producer about a reality TV show based on their lives. It is the recent spirit of cooperation among local leaders, however, that the two say makes them feel like outcasts, invited to come in from the cold. Perhaps this is why they have expanded their offerings into friendly bashes, like an August festival called Sorcery of the Sun and the Winter Frolic in December. Day and Poirier are regarded as marketing geniuses. Day’s slick Web design skills and political science background have been sought by downtown businesses and utilized by local politicians. In other words, he could sell ice to Eskimos.
" Each year at Halloween, the chill winds of autumn whisper to Witches, Warlocks and welcome strangers who journey from around the globe to Salem, Massachusetts to stir and summon the shades of the dead who walk among us at Samhain. From time out of mind, the people of the shadows have used this magical evening to walk where most fear to go. By spirit, by fire, by blood, and by book, we will conjure and constrain the spirits of the wandering dead to do our bidding." 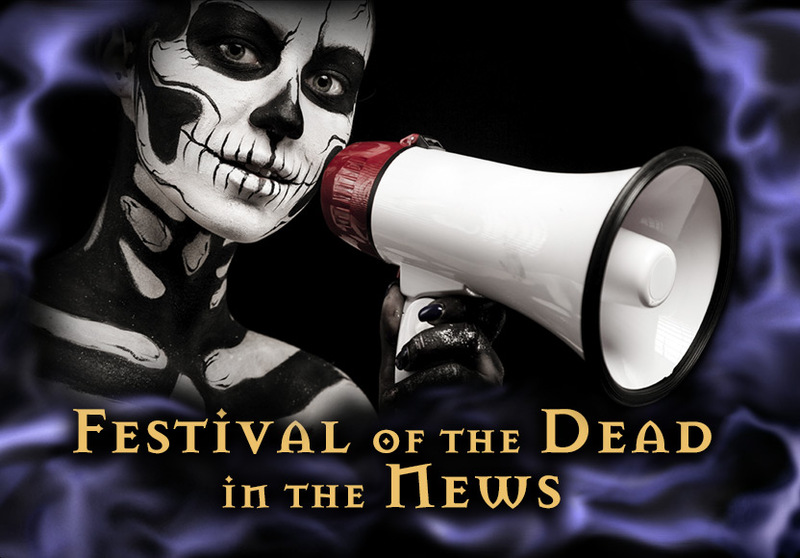 The Festival of the Dead aims to unlock the mysteries behind life’s inevitable destination by offering classes on paranormal investigation and an evening dedicated to the Ouija board. On Friday night, revelers will dance through the evening to Goth and industrial music at the Witches Halloween Ball at the Hawthorne Hotel. Guests can get free Tarot readings and there’s a $666 cash prize for best costume. This year’s theme is Return of the Warlock, celebrating the men who often get overlooked in the witch world, says Day. Next year, they are planning for a "Scarlet Letter" theme, tying in Hawthorne, the hotel’s namesake. On Saturday will be the Vampire’s Masquerade Ball and Sunday is an event called Messages from the Spirit World, where Poirier conducts a séance. On Halloween, the Witches Dumb Supper honors the dead with a dinner observed in total silence at the Lyceum Bar and Grill. To the banquet, guests are invited to bring mementos used to summon the spirits. The two organizers make money from these events, which cost some serious cash to gain entry, but you have to wonder how they manage to muster such excitement for October every year, a month some Salem-ites wish would never come. "Sometimes I feel like I’m getting too old for this," says Poirier, 40, "but unless I win Megabucks and have a farm in Vermont where I can practice witchcraft, Salem is our Moulin Rouge and the show must go on." 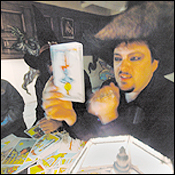 Poirier, who bears the title High Priest of the Salem Tradition of Witchcraft, has been involved in Halloween witch celebrations in Salem for 15 years. A love of the holiday provides all the inspiration required to embark on months of preparation, organize the many events and hang the slick black, sometimes controversial posters advertising the Festival of the Dead all over town. Provocative signs featuring Day in a top hat and a sneering Poirier smoking a cigarette say things like "Death is Not the End" and "Dance with the Undead." At one time they poked fun at Haunted Happenings with a slogan that read: "Here’s a Happening that’s Really Haunted." One poster features the Countess Bathoria - a Montreal based B-movie actress who joins them for the Vampire’s Ball - with blood dripping from her mouth to her ample bosom. "I almost have a nervous breakdown every year with all the things that can go wrong," says Day. "But we get through it with a combination of perseverance and magic." Poirier says it is "totally overwhelming" and even "humbling" to think that the festival brings so many visitors every year. His estimation, combined with those who enter the psychic fair, is thousands upon thousands. America Online recently rated the local Witches Ball one of the country’s top 10 Halloween parties, up there with Hugh Hefner’s Halloween bash and the Fetish and Fantasy party in Las Vegas. Prior to the mayor’s fund-raiser, Day sits in the decorated mall space amid the din of psychic readers and their clients at the festival’s Annual Psychic Fair and Witchcraft Expo. With his skull- and coffin-ringed fingers, he meticulously sews silver charms onto a black crushed velvet cape with thick black thread. Day, 36, grew up all over the North Shore with his single mom and went on to study political science at Brandeis University. He identifies equally with the labels "political animal" and "witch." At the suggestion that this fiscal conservative is also a "Republican," Day considers this and says, "a Weldian or Giuliani Republican," referring to the former Massachusetts governor and New York mayor. With his white Macintosh laptop tucked under one arm, he can be spotted about town the rest of the year, doing freelance Web design. Last year, he designed the campaign materials and Web site for Kevin Harvey’s run for mayor. He takes the credit for mall merchants now advertising as a group since he designed a joint ad campaign last year using the "Wizard of Oz" ruby slippers theme. The spirit of cooperation among those in Salem has Day, notorious for his rants about the Witch City, all a-twitter. His friend "Pastor Phil" Wyman from The Gathering, a contemporary church on Essex Street, loaned the psychic fair 25 chairs. The church also touts Halloween activities for Pagans and all faiths. "Jesus lent us chairs," says Day. "Now, after October, I will help Phil with a marketing plan for his church." He compares the witch community to the cartoon "Super Friends," each with their unique talents, and praises the city of Salem for putting aside competing interests for the limelight and finally mixing a good brew of the cultural, maritime history, spiritual and kitsch. "You boil it all together and there’s something pretty interesting to see," he says. One wall at the festival headquarters is filled with glossy headshots of the psychics. A crystal ball reader is packing up for the day as a powerful looking woman with short blonde hair, named Moon, walks into the room. She was the first witch Day ever met when he was 19. "She scared me," he says. "She was moody and exotic." "He was eager to learn and hungry for knowledge," she says of Day. Day is still pointing out the cooperation among people when Bart, a mall security guard, comes in for a friendly chat. "Bart’s a Christian," says Day, pointing out their ability to still get along. He then describes how Moon "bores into the soul" of those she is reading. "If you have skeletons in your closet, she’ll see them." "I’m like the pagan police," says the Grace Jones look-alike, playfully directing the comment at Bart. But the differences here don’t matter, because, says Day, "this is Salem at Halloween and we’re all here to give people a good time."